Part of me really seriously thought I may not ever want to run after the marathon. I wasn't sure how my body would recover or if it would ever recover. Monday: I stayed home (sick day?) , relaxing, lots of bengay, wearing Zensah compression sleeves & my medal. I did venture out to take Izzy to daycare and the boys to school & I did stop by my favorite consignment shop downtown and bought a pair of jeans. I went down the three steps we have, very slowly and with quite a bit of pain. Calves felt great - quads super tight. Tuesday: I did go to school today and I did use the elevator - several times. Thinking about taking the stairs in that building scared the crap out of me. Calves still feeling great - quads feel like they are going to explode. Oh and more bengay. Wednesday: I took the stairs - up AND down! and with very little pain. I didn't feel as tight in the quads. I decided to see if I was physically able to run - my arms were pumping but my legs wouldn't bend or move. Crazy feeling. Thursday: I am feeling almost normal - so I decide that it's yoga night. I felt great afterward! Friday: I feel 100% normal - and took advantage of the great weather (and furlough day) and went for a run on the rail trail while Tucker followed me on his bike. I felt great afterward! Saturday: Still feeling great, so I took Izzy for a run in her jogger on the rail trail. 3 miles today. Sunday: not sure - maybe yoga or rest or bike ride. I do know I'm not going to run. I don't want to push it too much! So, what's next? At the end of the month, I will be running the Spooky 5K in Freeport. This will be Tucker's 5k debut and I'll be running with him. Now we have to plan some fun running costumes. Will I ever run a marathon again? Yes, most definitely, but not right now. I'm going to rest and enjoy some 5ks and 10ks and enjoy winter running for a bit. I'm sure I'll do the January Thaw and Midwinter Classic runs. But sometime later this winter someone else in the family will be ramping up his marathon training for Boston! Yep - that's right. The husband got into Boston. We are all super excited for him. What's great is that the brother-in-law got in too, so all 8 of us will be heading down to Boston in April. 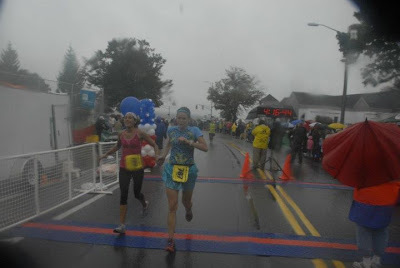 My thought is that I will train with Stacy when she trains for her 1st marathon (which will be the Maine Marathon next October) and I will run the MDI Marathon which is usually held 2 weeks after the Maine Marathon. That way I will be available to support her throughout her 1st marathon. Glad you've recovered! I can't wait to run with you ladies! Congrats to Ward and Wade, that's awesome! Well done guys on Boston, that is awesomeness. You made it trhough the recovery week. Congratulations. Keep running those marathons! They are definitely addictive. Glad to hear you have recovered and feel back to normal again! Sounds like you already have a great plan for what you are going to run in the future. The 5K with costumes is sure to be a lot of fun for you and Tucker! WHOO HOOOO!!! MDI is amazing, awesome, well organized, beautiful and SO MUCH FUN!!! I'll be there, not sure if I'm going to do the relay or the full....either way, I'll be there. Reading time & something exciting!